Each vintage we select individual barrels of wine of exceptional quality from Oregon’s best vineyards and winemaker to bring to you through our label. Each carefully selected wine offered under our label provides a truly outstanding wine produced by a unique combination of terroir, growing season, winemaking, and barrel aging. We offer a broad range of pinot noir styles from a number of Oregon AVAs, as well as outstanding Oregon chardonnay and riesling wines. Bottlings range from 25 to 100 cases. A beautiful example of a lighter-style Oregon pinot noir, our Vigneron’s Blend No. 1 is fresh, fruity, and uplifting – and looks like a swirl of sparkling rubies in the glass. Extended aging in oak barrels make a nicely rounded wine with a supple, silky mouth feel. Vigneron’s Blend No. 1 is made from grapes from lower-elevation vineyards in the north and central Willamette Valley noted for producing pinot grapes with delicate fruit and spice qualities. Aged 15 months in French oak barrels. Tasting Notes: A bright, well-structured Oregon pinot noir palette with a charming balance of fruit and complexity. 13% alcohol. An outstanding pinot from from Oregon’s warmer-climate southwest region, Vigneron’s Blend No. 2 offers intense pinot flavors and deep ruby colors. This wine is an outstanding exemplar of warmer-climate Oregon pinot noir – fresh summer berry flavors with lingering spice and stonefruit on the finish. A wine with distinctive, engaging, and long-lasting pinot fruit flavors. Aged 15 months in neutral French oak barrels. Tasting Notes: A well-balanced Oregon pinot noir with bright yet long-lasting berry and summer fruit flavors. Very inviting color and nose. Pinot noir grapes from Oregon’s higher-elevation vineyards enjoy the warm summer days and cool evenings that bring deep flavors and complexity to pinot noir grapes. Vigneron’s Blend No. 3 is an outstanding exemplar of higher-elevation Oregon pinot noir – fresh summer berry flavors with lingering spice and stonefruit on the finish. Tasting Notes: Bright fruit flavors, well-balanced structure, bright pinot flavors from front to finish. 13% alcohol. Vigneron’s Blend No. 4 is made from grapes from a special vineyard located 210 meters above sea level in the western hills of the central Willamette Valley. The 20 year-old vines in this vineyard benefit from sunny mornings with cooling Pacific Ocean breezes in the afternoon. In this favored vineyard location, the Wadenswill and 777 clones in this wine provide intense pinot fruit and spice qualities. This wine is a true pinot noir classic that is now being served in some of the best restaurants in Europe. Aged 24 months in American oak barrels with light toast. Tasting Notes: An intensely flavorful, elegant Oregon pinot noir, immensely satisfying from front to finish. An outstanding pinot noir from the spectacularly beautiful Columbia Gorge AVA in north-central Oregon, Vigneron’s Blend No. 5 offers a spectrum of warmer-climate pinot characteristics, from delicious pinot fruit flavors to bright ruby colors that seem to glow in the glass. Tasting Notes: An immediately engaging wine that brings a rush of summer berry flavors up front, intense fruit in the middle, and a lingering spice finish that invites yet another sip. A rare blend of selected pinot noir clones from three vineyards in the north end of the Willamette Valley AVA, this pinot is soft, velvety, and delicate in the mouth. It offers an extraordinary breadth of pinot flavors that can only be achieved by careful selection and blending of well-aged pinot wines to create a perfect harmony. of aroma, flavor, texture, and finish. An exceptional pinot that invites comparison with the very best of Bourgogne. Tasting Notes: A soft, velvety feel to the wine up front that quickly melds into an amazing palette of pinot summer fruit flavors carried to a finish of rare elegance and spice. A truly memorable wine. Vigneron’s Selection No. 7 offers a perfect marriage of pinot clones grown in an ideally situated vineyard and aged in a brilliant combination of French and American oak barrels. The Wadenswill and Pommard clones that compose most of this wine lay a foundation of deep pinot flavors, while the clone 777 component adds spice and refinement — making a perfect marriage of the three pinot clones in this wine. Extended aging in oak barrels for24 months lends a nicely rounded wine with supple mouth feel. Tasting Notes: Intense, upfront fruit flavors that soften beautifully in the middle of the mouth, followed by a long, lingering spice finish. 14.3% alcohol. Vigneron’s Selection No. 8 is a blend of pinot wines from two outstanding pinot vineyards in the Willamette Valley, one occupying a full-sun hilltop location and the other resting snugly in the rolling hills of the western Willamette Valley, just above the valley floor. The blending of pinots from these two differently situated vineyards yields a wine of exceptional depth and complexity, with an intensity usually found only in warmer-climate wines. Tasting Notes: Elegant, fresh summer berry flavors that fill the mouth, with lingering spice and stonefruit on the finish. 14.3% alcohol. “Where pinot noir is content, chardonnay will flourish.” Oregon’s ideal conditions for pinot noir are, if anything, just as favorable for chardonnay. In addition, Oregon vineyards with the right elevation, slopes, and schist-soils are now producing some of the most elegant, charming pinot blanc, pinot gris, and riesling wines to be had anywhere. 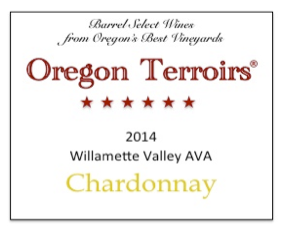 Our 2014 Chardonnay is an amazingly spicy yet elegant chardonnay from one of Oregon’s premier higher-altitude chardonnay vineyards. Aged in new oak for 8 months, this chardonnay will bring bright fruit and spice flavors to any meal or occasion. A chardonnay to savor. Tasting Notes: Immediate engagement with intense spice and tropical fruit flavors up front, a lush rewarding middle, and a cleansing finish with a lingering sensation of spice on the tongue. 13.5% alcohol. Our 2014 Riesling is an outstanding example of what Riesling from Oregon vineyards can be — rich in distinctive riesling grape flavors, yet refined, elegant, and delightful. The perfect white wine for a summer afternoon – or to start the evening. Tasting Notes: Immediate rich and spicy riesling flavors up front. smooth and refreshing through the middle, with a lingering but clean fruit finish. 13% alcohol. 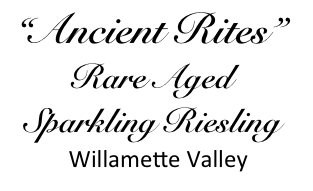 A veritable hidden treasure, this rare sparkling riesling was bottled in magnums many years ago (no one remembers exactly when! ), carefully placed in cellar for extended aging — and then forgotten for many years! We discovered this treasure in the corner of the wine cellar a year ago, literally covered with dust and cobwebs outside, but containing the kind of rare nectar inside that only years of quiet aging can achieve in a wine. We brought the wine to completion of its methode champenoise (second fermentation), and the result is a truly rare and extraordinary sparklng riesling wine sure to bring pure delight to connoisseurs of aged wines and riesling.